This was just for fun, not a serious project. As per info online, it’s supposedly from the 1945-49 era. Fortunately for me, someone donated it and the only part that I was interested in was the fact that there is no schematic available online. And no surprises here, the condition was also not that good. This is how I received it. Also, I traced the schematic and attaching it here. This is a 4A schematic I updated to reflect the changes for 2A. There are no major changes, other than a few missing resistors, changes in resistance values, and a missing AC Balance Pot. One major change is the use of 6X5 as rectifier, instead of semiconductor in 4A. I have identified the changes above in RED. 8.3 Ohm Resistor in the battery circuit was bad, I used a 47 Ohm and 10 Ohm in parallel to arrive exactly 8.3 Ohm. I had to try few 47 Ohm resistors until I could get exactly 8.3 Ohms to get the right value within tolerance window. 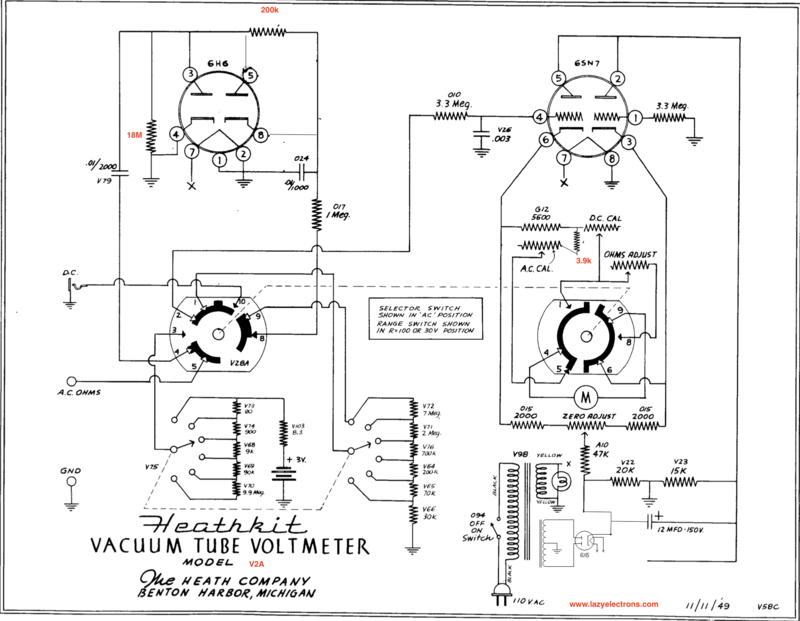 Posted in Electronics, Speaker, AudioTagged Heathkit V2A Schematic, Heathkit Vacuum Tube Volt Meter Repair, Heathkit VTVM Repair, Heathkit VTVM Restore, Heathkit VTVM V2A, V2A SchematicBookmark the permalink.